Not sure about the AGM as it is a bit later than normal so I may well be away at Scout camp so no entries this year! When I get the chance I'll pop the loco apart for a pic of its innards. To get a colour match I paint a patch of colour on a scrap of plasticard then scan it and then use that as a template to draw colour from to add to the transfer. It doesn't always work so then after applying the transfer I give the body colour bit a quick but steady wash of diluted enamel colour by brush. If you're not steady enough and some goes over the lining it is easy to remove but with a clean brush dunked in thinners/white spirit. The final coat of varnish blends everything in. I've used the Nigel Lawton motors in a couple of ways now. On a couple of locos the Farish chassis is too high so I've removed the motor element and replaced it with the new motor with worm attached. There has been some debate as to how long the motor will last like this if there is too much movement lengthways on the armature but I use washers etc so there is no movement and I've had no problems. When I get round to taking a picture of the 'C's chassis you'll see it is fairly similar but with the motor having the drive collar attached directly linking it to the loco via drive shaft. Basically I've either modified a Farish chassis or just plain used the N Brass one where the choice of motor is yours. I did have a Mashima motor for the 'C' but it would mean a massive coal mound so went for the Nigel Lawton one. 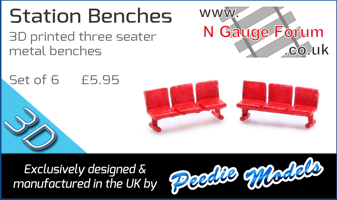 The transfers are indeed made to the same size as the tender side so no paint is needed initially and does include the base colour. As the 'C' has black edging that is really the only paint you need just to run it down the corners and edges if any of the white transfer is showing. This method also works for tank and cab sides. For cab sides scan the side first and copy it into Word when you are drawing up the livery elements. You can then lay these over the scan to ensure you've got them the right size/shape. Below is the promised photo of the chassis. The lump you can see behind the motor is just a bit of lead weight. That is a very elegant solution indeed, and the photo helps a great deal. Enlightening and inspiring. Thanks for the picture of the chassis and drive, Gareth. I can see these components coming in handy in the future! I'd tried scanning the base colour in the past and the resulting print is nothing like the base colour... Such a shame as I've got hopes that I can use your methods to do my C1 cab and tender without having to resort to using separate transfers. I'll have to have a bit of a think about this as the results you've been obtaining are truly stunning! I've already built quite a bit of it. The tender is complete except for the buffers and springs which will be added later. It will be tender driven and the chassis is a butchered Terrier which I have used/done before for other locos. Despite the small size of tender the whole coal space is empty yet it weighs more than the original Terrier. I've soldered up the bulk of the loco body and am using plastic tube for the boiler. It will grind to a halt soon as I need 10mm drivers. I've some Farish ones but they are fractionally to wide to fit inside the very narrow body/splashers (a common problem when modelling pre grouping). Not a problem though now as the latest Farish/Dapol drivers profile is much narrower so that will be the route I take, I just need to work out which ones and then source them. I was being a bit generic with 10mm wheels as the O's had 5' 2" wheels (I hope) so actually a little larger. I was looking at 10mm to ensure they fitted inside the splashers with the flange making them seem a bit bigger. I've a set of the new Farish 08 wheels but these are earmarked for something else. At the moment it may end up with a set of Dapol 45xx wheels that I've to hand until something else turns up. Split frame isn't a problem. Not sure if I will bother adding pickups from the loco or not as the Terrier works well on its own. Quick update on the 'O' Class which is pretty much finished. Yum! If only that was available RTR for us Southern modellers. Or even in kit form. Most of it is a kit from Worsley Works. If you look at the photo further up the page the silver bits are the kit. You need to fabricate a boiler barrel, axle boxes and springs and boiler fittings from NBrass. I can't remember the manufacturer but there used to be a white metal kit. One came up on Ebay recently but did go for quite a bit IIRC!